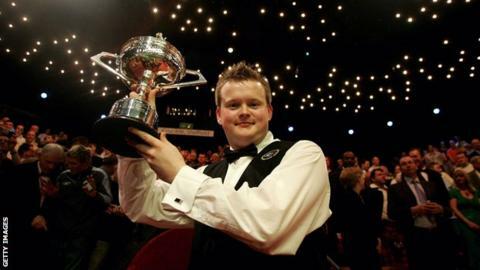 Every snooker player would "die for an Olympic gold medal", according to former world champion Shaun Murphy. Snooker's world governing body has submitted a bid to have the sport included at the 2020 Olympics in Tokyo. Five-time world champion Ronnie O'Sullivan does not think it merits inclusion as he believes the world title would matter more to players. "I cannot understand any sportsperson not wanting to go to the Olympics and be part of it," Murphy told BBC Sport. World number two O'Sullivan, who has won 27 ranking titles, said "a World Championship, UK Championship or Masters title would always come before Olympic gold". But World Grand Prix champion Judd Trump said in January that "getting the gold medal would top winning the World Championship" - and Murphy agrees. "I am astounded that Ronnie O'Sullivan feels it is not his cup of tea," said the 32-year-old. "Of course, you want to do well in your own game, like winning the World Championship, UK Championship and Masters, which are the biggest things you can currently do as a snooker player. But an Olympic gold medal? We would all be there for that. "Our sport will continue when we retire and it is should be part of the Olympics. I don't even know why we are having this debate. Snooker should be in the Olympics. End of." Would Olympic gold be better than world title? Seven-time world champion Stephen Hendry: "The Crucible is the pinnacle of the sport. The standard in the Olympics would be diluted because you would have countries turning up that would not be able to make a 20 break. "As a former world champion, I don't think the Olympics would be right for snooker." Six-time world champion Steve Davis: "There would be a discrepancy in standard to start with but looking long term, when it drags the standard up of every country, when there are heroes from all around the world, then is the moment all of a sudden that winning the Olympics for your country would be on par with winning the World Championship." Ken Doherty, world champion in 1997: "If snooker did get into the Olympics, the players would jump at the chance of getting on the plane to Tokyo. I certainly would. How much are we different from the other sports, particularly golf? "We tick all the boxes and should be given a chance. It would be a great honour for any player to represent their country but I don't know if it would be as big as winning the World Championship."